Of the homes first listed for sale in the Belwood of Los Gatos, Belgatos, or Surmont subdivisions in 2015 so far, only one did not selll (it was pulled off after a month, which is about the time when a price reduction would likely be getting discussed). One other is currently under contract (contingencies are in place) and five homes have been sold and closed. Overall, houses in this neighborhood have gone pending fairly quickly, with the average days on market being a brisk 9 for the five closed sales. Homes sold so far are all selling over list price, and the average amount over is about 3% ($38,000). Today I’m working on an article for another blog of mine on the topic of saving for a down payment and residential real estate appreciation in Silicon Valley. Long story short, right now, home buyers cannot save as fast as the home prices are going up. For some, the saving effort is to get to 20% down or more. For others, the goal is to buy all cash. In both cases, though, the danger is getting priced out of the market while the would-be home owner is putting away money. For people who wanted to buy 2 years ago but decided to wait and save, that now means either not buying at all or buying in less nice home or area than they were targeting. This is certainly true for home buyers wanting to get into Belwood of Los Gatos and nearby. Let’s look at our corner of Los Gatos and take a sampling of what has happened since 2000 (a “boom year”) for a typical 2400 square foot house on a typical 9,000 to appx 10,000 square foot lot (in Belwood, Belgatos or Surmont). For this, we will consider homes sold in 2000 and homes sold within the last 12 months. I ran the numbers this afternoon on MLS Listings, our local multiple listing service provider. 1-1-2000 through 12-31-2000: a home of about 2400 SF on a 9,000 – 10,000 SF lot averaged a sale price of $860,000 (prices ranging from a low of $750,000 to a high of $950,000). A 25% down payment would have been $215,000 and the loan amount would have been $645,000, using that average number. Many buyers would have purchased with 20% down, and some with 30% or more, though. Fast forward to today and the last 12 months leading up to today – approximately 15 years later. 6-9-2014 through 6-9-2015: same sized home and lot averaged a sale price of $1,512,000 (prices ranging from a low of $1,350,000 to a high of $1,660,000). This does not include pending sales, of course – just those which have closed escrow. This afternoon I ran the recent listings and sales in the Belwood of Los Gatos, Belgatos, Surmont and nearby areas. 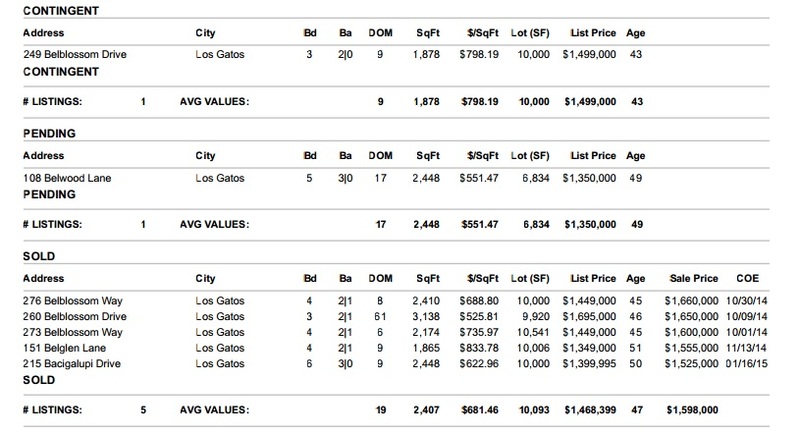 These contiguous east Los Gatos neighborhoods have extremely low turnover, so not surprisingly, there are few sales!! It should be noted that larger homes on larger lots usually sell for far less on a price per square foot basis – so it’s not really fair to compare a house on an acre with one sitting on a 10,000 sf lot. Additionally, homes in the $2 million plus range are a very different creature than those closer to $1 million in terms of multiple offers and the sale price to list price ratio. In some cases, though, even these higher end homes get multiple offers and sell for more than the asking price. Finally, the type in the image below is a little small, but if you click on it, you will get a larger, more readable version. Real estate sales this year in the east Los Gatos areas including Surmont, Belgatos, Belwood of Los Gatos and homes close to Harwood but within the Los Gatos town boundaries have been small in number due to the extraordinarily tight inventory levels. Below are the closed and pending sales as reported in the MLS for this calendar year so far. Of the nine closed sales, 5 sold for more than list price – most or all of these were multiple offer situations. The other four had a variety of situations: one was bank owned, one needed several hundred thousand in finishing work (there was no kitchen, there were no bathrooms, etc.). The one on Alerche sold “off market” and “off mls”. Interested in buying or selling a home in or near this pretty corner of Los Gatos? Please give me a call or send me an email today! Los Gatos housing inventory may well be at an all time low. For other blogs, I crunch the real estate numbers regularly and can tell you that in the last 15 years (for which I can get MLS statistics) there’ve never been so few available homes to buy. I’ve been selling real estate for 20 years now and don’t remember it ever being so dire. In fact, the worst year ever still had twice as many houses for sale as what we’ve got now. The available inventory in Los Gatos, and Santa Clara County generally, is inching up. The numbers have risen about 25% from a couple of months ago, but are off between 30% and 65% from the year before, depending on how you slice and dice the numbers. In our lovely corner of east Los Gatos, right now there are only 2 homes for sale, one on Blossom Hill and one on a side street at the corner of Blossom Hill. Last year there were 13 sales in the neighborhood, and in 2011 there were 17. We could use more inventory! If you are thinking of selling in 2013, now is a great time. There’s little competition and a very strong level of buyer demand. Please call me for a free, no obligation, no pressure consultation. Please email me at mary (at) popehandy.com or call me at 408 204-7673. What’s selling in the Belwood, Belgatos and Surmont areas of east Los Gatos? How’s the market? The home on Belvale had 6 or 7 offers – I know because I placed one of the bids on it for my buyers! There were also multiple offers on the Bacigalupi house as well. Both are said to have sold over list price. Most homes are selling pretty fast now, and at very good prices. If you’d like to buy or sell a home in the Surmont, Belgatos, or Belwood of Los Gatos areas , please call me! I’m a resident (since 1999) and a Realtor here in Los Gatos with Sereno Group and know the area like only a local does. How’s the Belwood, Belgatos and Surmont real estate market? Right now there are 5 houses for sale in Belwood, Belgatos and Surmont. Of them there are 4 “regular sale” properties available and one short sale in the neighborhood (2 on Westhill, 1 on Belhaven, 1 on Belblossom and the short sale on Belwood Gateway). One home, which was very affordably listed at $875,000, is sale pending. Additionally, a bank owned property or REO (real estate owned by the bank) is under contract. How long have they been listed for sale? The two on Westhill just came on the market within the last few days. Two of the five have been available for about 60-70 days. You can read the MLS info on each of them on my ValleyOfHeartsDelight blog. How are prices? Four neighborhood homes have closed escrow in the last 30 days, with prices ranging from $975,000 to just under 1.2 million. Months supply of inventory: To figure the months of inventory, you simply divide the actives by the solds (from the last month). We have 5 available and 4 which have closed – so 1.25 months of inventory. That looks pretty good but if you live in the area you know that these things tend to come in waves and just a month ago we had “infinite” months of inventory. So don’t get over excited about this and price your home too high – if houses are priced appropriately, they are selling. If not, they are sitting. Below are live charts and graphs from Altos research for the 95032 zip code. They will automatically update themselves each week, so even if this post appears “old”, the info below will always be current! Is that east Los Gatos home nicely remodeled or simply flipped? Want to buy a house in the Los Gatos neighborhoods of Belwood, Belgatos or Surmont? There are a few things you should know about properties that look “turnkey”, especially as the market heats up or inventory more available. Home sellers who quickly improve houses for a fast profit, rather than for enjoying the house for their own use, often cut corners. Whether it’s owners doing a quick makeover or investors remodeling or improving select items, beware! Some of these properties give the impression of being “perfect” but in fact may only have been cleaned up in the most visible areas. plumbing – has the home been re-piped, or are the old galvanized steel pipes still in the walls and under the house, ready to give up the ghost? large trees – have they been trimmed, or are they an expense which will fall on you? Is this an investment property (purchased by investors at a foreclosure auction or as a distress sale)? Or is it a trustee sale where the family or friends inheriting the property are fixing it up for sale (almost like a flipped house)? Were there pre-sale inspections? If so, did the owners or investors do the Section 1 work from the termite report and the health & safety issues called out in the home inspection? The home inspection (not the termite or pest) should flag any major issues with the foundation, electrical, mechanical etc. systems in the home. If there’s no home inspection, prepare for surprises in these older homes. In Surmont, Belgatos, Belwood, and all of the east Los Gatos, Cambrian and Almaden hillside areas, water and drainage is an issue, as mentioned above regarding foundations. Left unchecked, water seeps into the crawl spaces under the houses and can create real havoc as our clay soil expands and pushes on the foundation. So look at the downspouts and see if they simply dump the water at the base of the house (which you will see most of the time – but it’s not a good idea, usually), or did the owner take the time and spend the money to handle drainage issues well? How’s the grading? Soil and landscaping should slope away from the house so that any water coming down will run away rather than seep into the crawlspace. Browse neighborhood homes for sale online on this site. When you visit in person, bring a notepad and jot down concerns or questions. It is so easy to fall in love with remodeling that’s been done that it may be easy to miss the expensive items not easily seen that may have been ignored. Need a good, local Realtor? Call or email me. I’ve been in real estate a long time (since early 1993), am very accomplished and recently was named “best real estate agent in Silicon Valley” by readers of the San Jose Mercury News. I’m also a Belwood resident and I know the area and its values well. 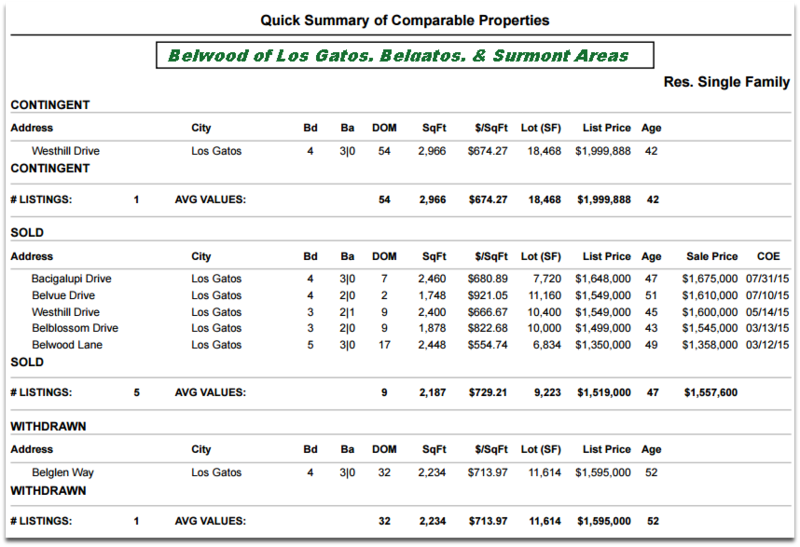 How Is The Real Estate Market in Belwood of Los Gatos, Belgatos, and Surmont (in east Los Gatos)? The Los Gatos real estate market has fared better than many other parts of Silicon Valley in recent months, but prices are declining, days on the market area increasing and inventory is climing. The median sales (sold) price of homes is down about 26% year over year in Los Gatos (95030 and 95032). List prices appear to be flat (see graph below, which is from Altos Research, a subscription I have) but in many price points, homes are being reduced multiple times prior to selling. The higher priced homes seem to be hurting more than the entry level homes. This is interesting because most of the “correction” we have been seeing is due to the mortgage mess, and a large portion of the very high end homes (more than 3 mil) are not terribly dependant on loans. Many of them are bought “all cash”. What about our east Los Gatos enclave of Surmont, Belgatos and Belwood? We, too, have rising inventories. At the moment, there are six homes for sale in these three Los Gatos neighborhoods. I can comment a little on these and perhaps it will seem less gloomy when I do. Two of the six are tenant occupied and difficult to see. They are not being actively marketed except on the MLS (no signs, no ads, no open houses – only the MLS and related web advertising). When homes are hard to see, they are hard to sell. One of them desperately needs a coat of paint and for someone to water the front yard, which has dead grass in it. Another of the six homes is really large and at the high end of the scale for neighborhood pricing. That leaves us with three other homes on the market. Every home has some kind of issue, and these three do too, but they are nice enough that they should procure an offer, even if not close to list price. Having homes on the MLS that don’t sell tends to really hurt the ones that DO want to sell. Bad makes worse. It’s hard to say. This morning at the Los Gatos – Saratoga Realtors board meeting, one lender said that it hasn’t been this bad since 1981. So it’s a challenging time for sure! It’s a good time to buy, but buyers need to carefully handle their loan papers to avoid glitches. Selling is doable, but sellers must realize that it’s a price war and a beauty contest. Homes that aren’t in top condition and priced aggressively are going to have a tough time selling. Please call me or email me if you would like a confidential meeting to discuss your real estate wants and needs. I’m happy to help! PS Please see also my Live in Los Gatos blog – I do market updates about once a week there. What’s Happening in Belwood of Los Gatos? Things have been hopping in east Los Gatos. Over the weekend, the Belwood of Los Gatos community participated in the “Community Yard Sale” that was happening throughout the town of Los Gatos. The cabaña was a busy place with folks selling their wares at what seemed like a good clip. Additionally, neighbors held yard sales in their own driveways and front yards too, as was the case all over this part of Silicon Valley. The pool is open and swimmers are happy as the heat has been bearing down on us. To see about scheduling a party there (if you are a cabana member), see the Belwood Community’s website. The real estate market is busy in Belwood, Belgatos, and Surmont too. There are now seven active listings and two pending sales in these three areas. As with other parts of town, not all homes are selling – only the ones perceived as being “the best value” for the money are getting offers and going to closing. If you’d like information related to your particular Los Gatos or Silicicon Valley home, please email or phone me! I’d be happy to meet with you, view your home and discuss your wants and needs as relating to buying or selling a home.